Oh no! Carhops is moving! And they’re taking the Junkyard off the menu! 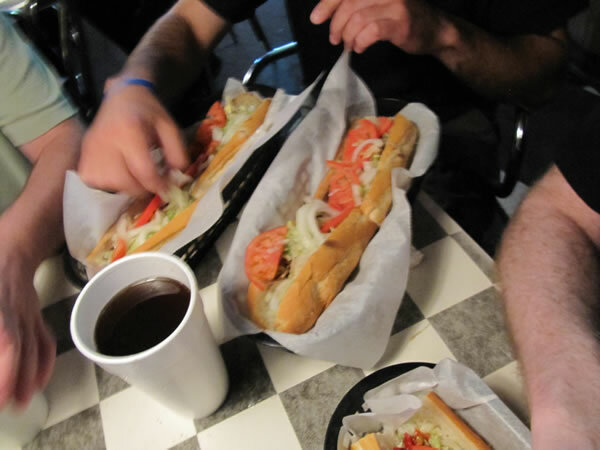 Carhops is famous for their subs and Junkyard sandwiches. 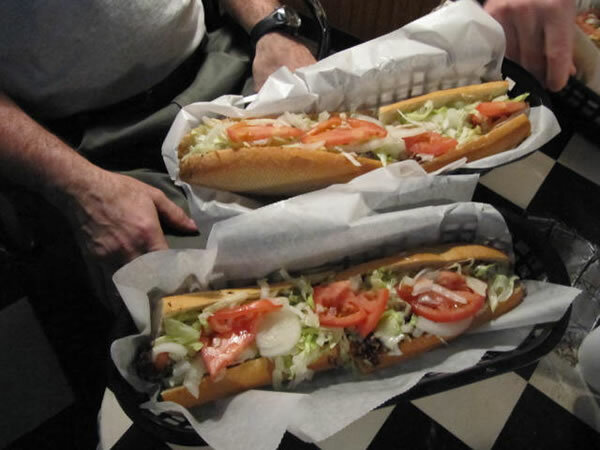 Their subs come packed with various meats, cheese, lettuce, tomatoes and onions in two sizes: the 12 inch (called a Coupe) and the 24 inch (called a Sedan). 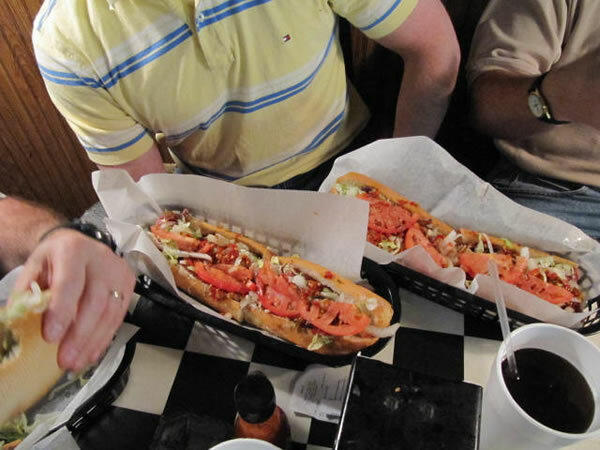 The pictures you see are two 12 inch subs – so each person had to eat both of them! 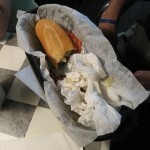 The Junkyard is similar to a Primanti Brother’s sandwich but some say it’s even better. 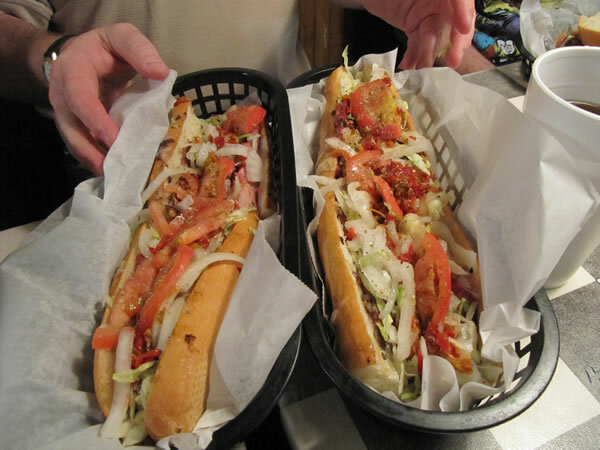 It’s bigger, has better meat, spicier coleslaw and bigger french fries all on Mancini’s bread – a Pittsburgh favorite. 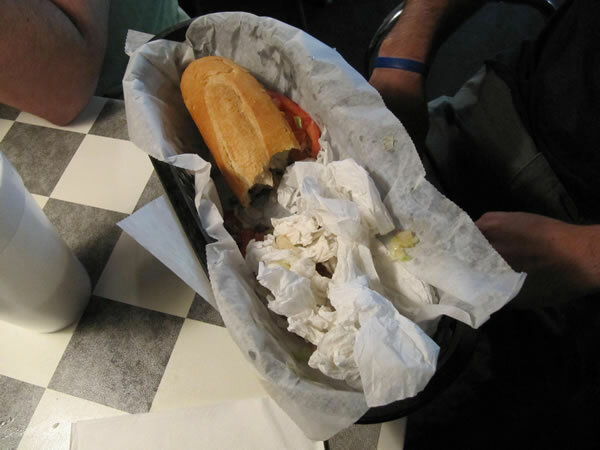 But since they are moving close to a Primanti Brother’s restaurant they didn’t want to compete with them and decided to take the Junkyard off of the menu. To quell our grief we decided to visit Carhops to compete in the second Sedan Challenge. One person actually went to Carhops every day for a week and bowed out of the challenge due to exhaustion. Eating is hard work! While we were there we found out that they are going to have an official challenge but the sub will be three feet instead of two! 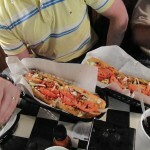 Four people compete to finish their own 24-inch sub from Carhops (Pittsburgh, Pennsylvania) within one hour. Everyone ordered whatever they could stomach. Find your favorite on the Carhops Menu. Believe it or not the same person that didn’t finish last time couldn’t finish this time either. He blamed it on the onions. He asked for no onions and was thrown off when his sub arrived with onions. The rest of the competitors finished with plenty of time to spare. – Don’t mind me, I’m taking pictures for the coroner’s report. – Who wants to get Dairy Queen Blizzards later? – That’s not sweat, that’s grease. – These seem to have gotten bigger. No, you’re just out of practice. – I think I need to reserve the bathroom stall for later. – It was an onion conspiracy! It’s like falling at the beginning of a foot race. It threw off my game. We wish Carhops and angry-guy lots of luck in their new location. Maybe when all of the managers are out of the office we’ll stop down for a long lunch. 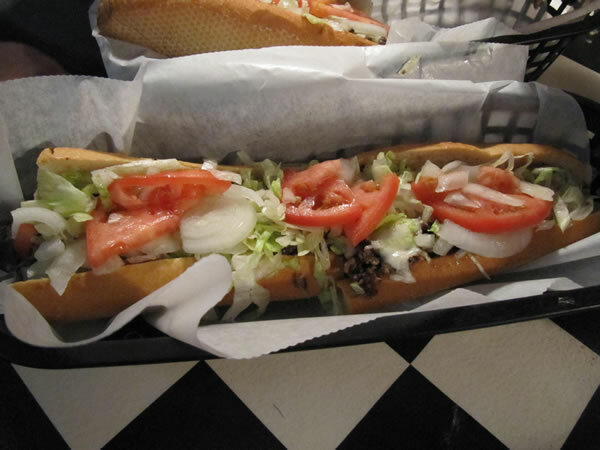 But only if you make me a Junkyard Cheesesteak with a Fried Egg on top.